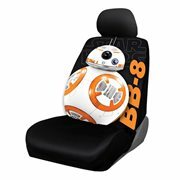 Cool Interior Car Accessories to Ride in True Fandom Style! 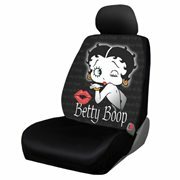 Personalize Your Vehicle with These Cool Car Accessories! true fandom style. 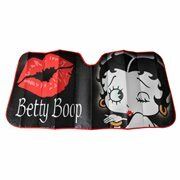 Take your pick from themed steering wheel covers, seat covers, shoulder pads, sunshades, license plate frames, mud guards, hitch covers, floormats, and more… and transform your car or truck into an impressive vehicle that's like nothing else on the road! From Star Wars, Batman, Superman, and Spider-Man to Mickey Mouse, Hello Kitty, Betty Boop, and The Nightmare Before Christmas, we've got what you need to trick out your ride in true fandom style. 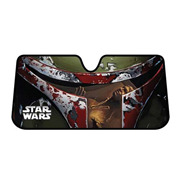 Take your pick from themed steering wheel covers, seat covers, shoulder pads, sunshades, license plate frames, mud guards, hitch covers, floormats, and more… and transform your car or truck into an impressive vehicle that's like nothing else on the road! Turn Your Vehicle into an Extension of Your Fandom! 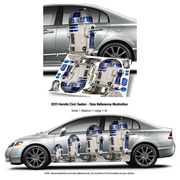 There are many, many ways to flaunt your feverish fandom, from clothing and jewelry to action figures and mini-figures to posters and fine art, but one of the most fun is to decorate your preferred mode of transportation with car decals and graphics. 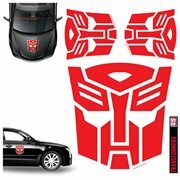 Make it look like Kylo Renn, a Stormtrooper, or Vault Boy is sitting in your back seat; badge your truck as a Zombie Outbreak Hunting Unit; or add a Transformers, Wonder Woman, or Deadpool emblem to your door. The options go on and on! Take a moment to imagine how wonderful and relaxing it would be to have dashboard bobbleheads of your favorite characters nodding away as you drive along your merry way, humming the theme song from a beloved TV show or movie. These amusing auto add-ons are a lot of fun and make any trip - even your onerous commute to and from work - much more enjoyable. Try it. You'll like it! Why drive all over town or endlessly search the Internet for the perfect fragrance in an air freshener or some other goody for your starship, Batmobile, Invisible Plane, or Rick and Morty-inspired flying car when you'll find what makes your cool conveyance purr with delight in our terrific selection of smell-good items and other embellishments themed to your favorite films, TV series, and video games?